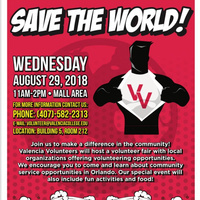 Day Two of Welcome Back Week will be hosted by Valencia Volunteers! Are you looking for an organization to volunteer at? Do you want to learn new skills and build your resume? Stop by the Volunteer Fair to meet nonprofit organizations that serve the Central Florida Community. They are looking for students like you to be a part of their organizations! This event is sponsored by Student Development! Join us in the Mall Aream from 11am-2pm!